The M12 FUEL Hammer Drill Driver is the Most Capable, Lightest Weight, Most Compact tool in its class. The POWERSTATE Brushless Motor delivers the power to do a wide variety of applications at 1700 RPMs and 350 inch lbs. of torque. Weighing only 2.3 lbs it is extremely portable, great for overhead applications, reduces fatigue throughout the day. At 6.6 inch L this tool has the best access in tight spaces. REDLINK Plus intelligence protects the tool from overloads and overheating while ensuring maximum performance. Using REDLITHIUM 2.0Ah compact and 4.0Ah extended capacity battery packs they deliver more work per charge and more work over the life of the pack than competitive batteries. The DEWALT DCD996P2 20V MAX XR Lithium-Ion Brushless 3-Speed Hammer Drill Kit features a high power, high efficiency brushless motor that delivers up to 57% more runtime over brushed models. This hammer drill has a heavy-duty 1/2-inch ratcheting nitro-carburized metal chuck with carbide inserts for superior bit gripping strength, and a 3-mode LED light that provides illumination in dark or confined spaces. A 3-speed, all-metal high performance transmission optimizes tool-to-task for fast application speeds and improved runtime, with 0-38,250 BPM for fast drilling in masonry materials. DEWALT DCD996B 20V MAX* XR Lithium-Ion Brushless 3-Speed Hammer drill is part of the DEWALT's Bare tool line. Bare tools offer flexibility and value if you already own a battery and charger. It features a DEWALT-built high power, high efficiency brushless motor that delivers up to 57% more run time over brushed. This hammer drill is ideal for most drilling and hammering applications. Hilti's SF 6H-A22 ATC Cordless Hammer Drill/Driver is the essential item for Tradesmen who require performance, durability and safety thanks to Active Torque Control feature that helps protect users if the drill binds up during a drilling application. This tool is the perfect add-on to any 18V or 22V Hilti Li-Ion Kit because it has the power to tackle tough applications and it is backed up by an industry leading commercial use tool warranty. This tool body is an excellent way to build out a kit that gives you exactly what you need to be successful on the job. 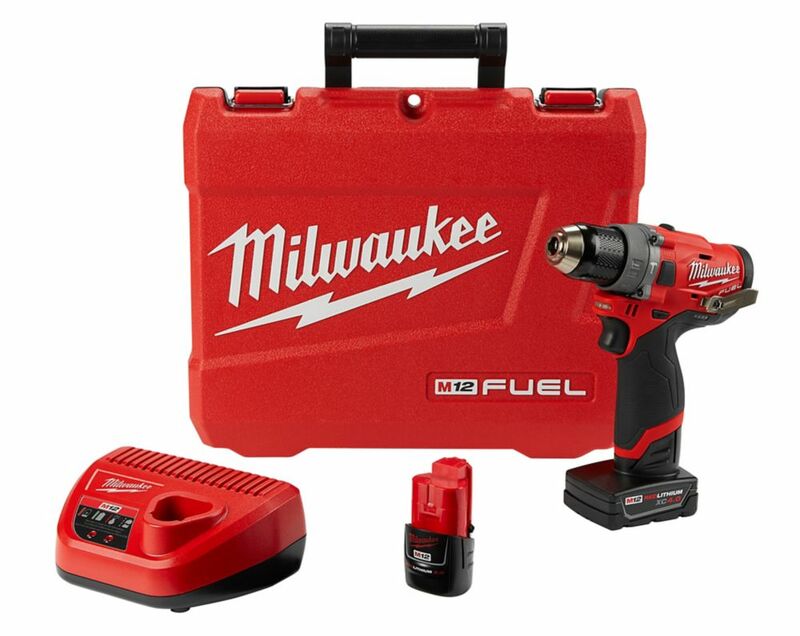 M12 FUEL 12V Li-Ion 1/2-inch Brushless Cordless Hammer Drill Kit with 4.0 Ah & 2.0 Ah Batteries The M12 FUEL Hammer Drill Driver is the Most Capable, Lightest Weight, Most Compact tool in its class. The POWERSTATE Brushless Motor delivers the power to do a wide variety of applications at 1700 RPMs and 350 inch lbs. of torque. Weighing only 2.3 lbs it is extremely portable, great for overhead applications, reduces fatigue throughout the day. At 6.6 inch L this tool has the best access in tight spaces. REDLINK Plus intelligence protects the tool from overloads and overheating while ensuring maximum performance. Using REDLITHIUM 2.0Ah compact and 4.0Ah extended capacity battery packs they deliver more work per charge and more work over the life of the pack than competitive batteries. M12 FUEL 12V Li-Ion 1/2-inch Brushless Cordless Hammer Drill Kit with 4.0 Ah & 2.0 Ah Batteries is rated 4.6 out of 5 by 70. Rated 5 out of 5 by Frank from Milwaukee Tool puts out top quality stuff. Light but powerful.... Milwaukee Tool puts out top quality stuff. Light but powerful. Rated 5 out of 5 by Rudy from This is a great kit! Works great! This is a great kit! Works great! Rated 5 out of 5 by JD from I have the M12 impact and regular driver but needed a hammer drill. When I seen the M12 fuel hamm... I have the M12 impact and regular driver but needed a hammer drill. When I seen the M12 fuel hammer drill I was a little skeptical about the performance being that it's only a 12volt but having a few other tools in the M12 line I figured that it wouldn't hurt to try it out. I'm glad I did. This little drill is a beast. Definitely worth the money.